People may complain about the matchmaking in Overwatch but, for one newly-engaged couple, it was spot on. Having met on Overwatch two years ago, Chris decided it was time to propose to his girlfriend Dominique and there’s only one other person he wanted involved: Jeff Kaplan. Maybe you’ll meet your soul-mate. Check out our list of the best multiplayer games on PC. The pair have been playing Overwatch since the beta, but they didn’t meet until later. However, Dominique moved to Japan for three months last year and had to stop playing. When she returned in the summer, Chris seemed to be the only one around. The pair began video chatting and getting to know each other via their group discord as friends. Chris travelled to San Francisco to see her. “It was love at first sight,” Dominique says. In 2016, @TheChrisEstrada and I were paired together in @PlayOverwatch and began our long distance friendship. In 2017, we fell in love. I moved 600 miles, we got an apartment, and decided to start a family together. The two found a place together in California and began trying for a baby. They were lucky, and soon Dominique was pregnant. The happy soon-to-be parents continued their love for Overwatch, attending Blizzcon with the group in which they met. All of which brings us to the proposal. Chris knew Overwatch should feature, it had been with them every step of their relationship, but he wanted to go bigger than a simple themed proposal. Chris set his sights on having Jeff Kaplan deliver the ring. 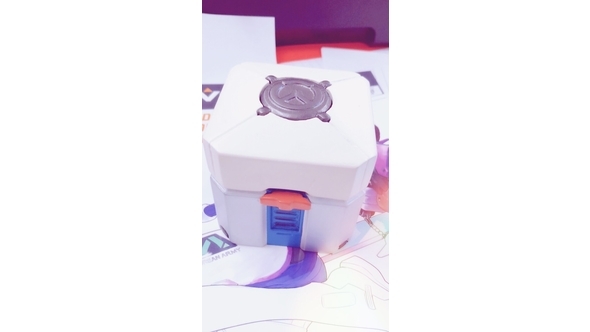 Not only that, he wanted the ring to come in a custom-made, Overwatch loot box-styled case. It wasn’t easy to pull off. When our groom-to-be first ordered his custom-loot box, the seller took his money and ran. When he eventually got someone to make and deliver his special box, there was a much more glaring issue – how do you get hold of Jeff Kaplan? Blizzard organised things from there. Chris got the ring and its custom case to Will, who got it to Sean, who got it to Jeff. Chris’ final task was to get to the rendezvous point. “We had to be at Blizzard’s centerpiece Orc statue at a certain time,” Chris says. “Then Sean and Jeff walked up. Kaplan cracked a joke about how his most important job is to walk around the campus delivering loot boxes and he handed it to me. 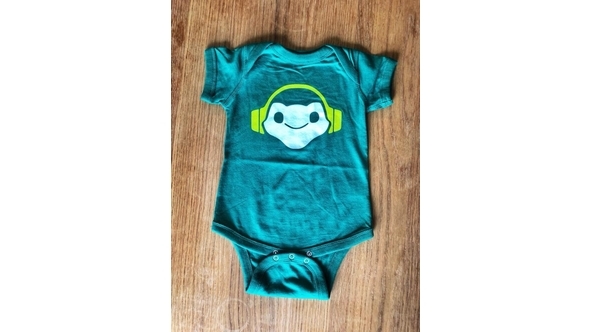 On top of an unforgettable Kodak moment, Blizzard surprised the pair with Overwatch-themed baby clothes and stuffed animals, as well as comfy slippers for the mother-to-be. More than just the thing that brought them together, Dominique and Chris both believe Overwatch continues to shape their relationship. “Dominique pretty much nailed it,” Chris says. “We met in the early days of Overwatch and just really played well together. Overwatch is a great gauge at how well you can work together with somebody, and also a look into how someone treats other people. When you meet people who are caring and positive, it makes the game so much more fun. We have updated this article with clarifications provided by Chris and Dominique.